A Quilter's Table: Give Me a J.U.K.I. Yup. There's a new sewing machine in the studio! When hubby asked me what I wanted for my milestone(!) birthday, I just put it out there plain and simple. 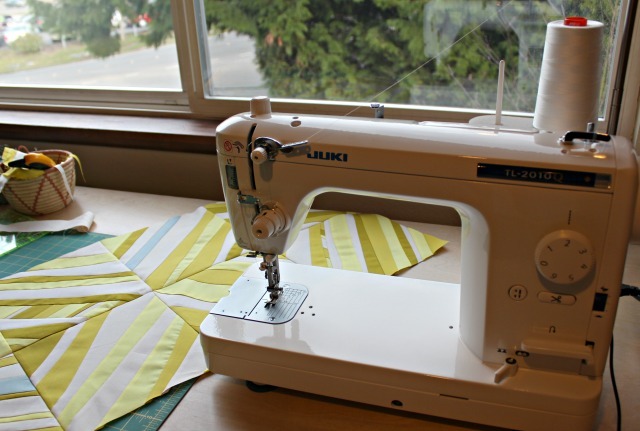 It's a JUKI TL-2010Q, which he purchased from our local Quality Sewing & Vacuum, where I also bought my Brother years ago, and where I've gotten my machines serviced for as long as I can remember. I've only sewn on it a couple of times so far, so I have much to discover I'm sure, but so far, I find her fast with a really lovely stitch. And see my string slab there with all those seams? The JUKI handled them so nicely, not turning any seam allowances on the back side the wrong way, and not bumping around at all. Smooooth stitching all the way. Oh yeah. So I'm a happy camper. And feeling blessed. Be prepared to fall in love. You are going to love this machine. Enjoy! What a fun gift! I just bought one too! It's unpacked but I haven't tried any serious sewing on it yet. Hope you enjoy yours! This is the best machine I have. I've had mine for six years and it goes like the wind. I piece the tiniest bits on it and have quilted a double quilt on it. Just keep it dusted and oiled and it will keep on sewing. I see you have Aurifil thread on it -- that's the only concession I made with it -- using good quality thread. Mine doesn't like poly thread. Let the fun begin! You will be enjoying your birthday for years to come! I would gladly trade in both my Husqvarnas for a Juki. Looks like you got a real nice machine. Happy Birthday! And that bit about turning the seam allowances the wrong way on the backside, grrrr! I struggle with that constantly know matter how much I pin or press. I love love love my Juki for the same reasons - FAST, reliable, basic. Yes. And happy birthday. Whoohoo! Congratulations! The seams allowances on the back -- those are the worst! Happy birthday and happy sewing! Welcome to the Juki sisterhood! I have the same machine and love her. Happy Birthday to you! My Juki was a Christmas present. We are still getting aquatinted, but thus far, I love it! Happy Birthday! Happy Birthday!! Have fun learning your new machine. I'll look forward to hearing how it impacts your fmq'ing. Happy Birthday Debbie. What a great milestone birthday present! My husband bought one for me this past summer. It's so great to have that extra throat space. oooh . . . lucky you. Have fun. Congrats! I've had my Juki for 2 years now, and just love it! Happy Birthday!! I think you did the exact right thing...telling your husband exactly what you wanted! A new machine sounds like a lot of fun to me. I'll keep it in mind for my milestone! Happy Birthday! I have this on my list to get and while I am saving pennies two of my sewing pals have purchased it. I will get there someday! Happy Birthday! I just got the same Juki. Love it! Happy birthday!! You will love this machine I'm sure - I am crazy about mine. Another commenter mentioned thread - I'm using nothing but Auriful now because if I use cheaper cotton thread, the lint is crazy and the machine is soooo fast, the cheap thread breaks all the time. Very frustrating. Congratulations on the new machine. I have heard a lot of good things about them. Is it as fast as they say? Nice! Beaut of a machine! You deserve the best.